Guatemala is located in Central America. It has an area of 108,890 square kilometers (42,043 square miles), slightly smaller than the state of Tennessee. Because of its consistently temperate climate, Guatemala has been called the "Land of Eternal Spring." Crops such as coffee, sugar, bananas, and cocoa are grown both for consumption in Guatemala and for export. 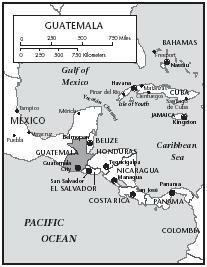 Guatemala, with parts of Mexico and Honduras, occupies the Yucatán peninsula, where the lowland forest of Petén, once the home of the Mayas, is found. Guatemala's main environmental problems are caused by deforestation—more than 50 percent of the nation's forests have been destroyed since 1890. The nation's water supply is also at risk due to industrial and agricultural pollutants. The history of Guatemala is often recognized in three stages: the Mayan Empire, Spanish rule, and the modern republic (which is in existence today). All three have had an influence on Guatemalan cuisine. The ancient Mayan civilization lasted for about six hundred years before collapsing around 900 A.D. 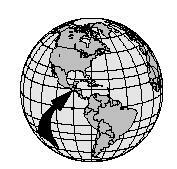 These ancient natives lived throughout Central America and grew maize (corn) as their staple crop. In addition, the Maya ate amaranth , a breakfast cereal similar to modern day cereals. Guatemala remained under Spanish rule from 1524 to 1821. Typical Spanish dishes, such as enchiladas, guacamole, tamales, and tortillas , began making their way into the Guatemalan diet. At the beginning of the twenty-first century, an empanada (meat turnover) could be purchased for about twenty-five cents, chicken tortillas for fifty cents each, and a hot beef sandwich for about seventy-five cents. Other countries and their cultures have also affected the Guatemalan diet, including the Chinese. Most Guatemalan cities and towns have at least one Chinese restaurant. Guatemala became independent from Spain in 1821, and continues to remain independent. In the late 1800s and early 1900s, banana and coffee plantations were established. Sugarcane became another successful agricultural crop by the end of World War II (1939–1945). Guatemala does not have a national dish, but there are many foods that have become a part of the everyday diet. Just as during the time of the Mayans, corn continues to be a staple food. It is most often eaten in the form of a tortilla (a thin corn pancake). These are usually served warm and wrapped in cloth. Black beans ( frijoles) , another Mayan staple, are eaten at almost every meal. They are usually refried ( volteados ), mashed, or simply eaten whole ( parados ). Rice, eggs, and cheese are also widely consumed. Chicken, turkey, and beef (roasted, grilled, or fried) are the country's most popular meats and are normally accompanied by beans and rice ( frijoles con arroz ). Meats are often served in stews ( caldos ) or cooked in a spicy chili sauce, though whole chickens may occasionally be served with the feet still attached. Pepián , a thick meat and vegetable stew, is a common dish in the area of Antigua (a town just outside of Guatemala City, the country's capital). Seafood is most common along the coasts, and is usually prepared with various spices. Other popular dishes are bistec (grilled or fried beef), guacamole (mashed avocado with onions and spices), mosh (porridge), churrasco (charcoal-grilled steak), and chiles rellenos (chiles stuffed with meat and vegetables). Fresh fruits and vegetables, such as yucca, carrots, plantains, celery, cucumbers, and radishes, help to keep the Guatemalan diet healthy. However, snacks, such as doughnuts ( donas ), are also widely popular. Guatemalan coffee, which is most often exported, is considered some of the best in the world. Most Guatemalans, however, tend to drink weak coffee loaded with plenty of sugar. Rich, savory coffee is more commonly found in tourist areas. Aguas , soft drinks, are also abundant. Sweetened fruit juice mixed with either water or milk, called licuado , is a refreshing alternative. Trim the ends and slice the radishes. Combine sliced radishes with mint leaves, salt, and orange and lemon juice mix in a bowl and serve as a salad. Heat oil over moderate heat in a skillet. Add bean puree and mix well with a wooden spoon. Stir until the puree thickens and the liquid evaporates. Continue until mix begins to come away from skillet and can be formed by shaking the skillet to give a sausage shape. Serve warm with tortillas, cheese, sour cream, or bread. Peel, remove the pit, and thoroughly mash the avocado. Add the bouillon and the minced garlic. Mix well. Add chopped tomatoes and onions, if desired. Skins may be left on the potatoes, if preferred. Slice the potatoes very thin. Heat 2 Tablespoons of the oil in a 9- or 10-inch skillet and sauté the potatoes and onion, stirring, until golden brown. Beat the eggs and gently mix the potatoes with the eggs. In another frying pan, heat the remaining oil and pour in the potato and egg mixture. Cook over medium heat without stirring until set. With a plate, flip over and cook on the other side until browned. Garnish with pepper and parsley. Heat the oil in a heavy saucepan and add rice. Sauté lightly until the rice has absorbed the oil, being careful not to let it change color. Add the mixed vegetables, salt, pepper, and chicken stock. Cool for about 20 minutes until rice is tender and the liquid has been absorbed. In a large saucepan, warm the oil over medium heat. Add the cucumbers, onions, and red pepper. Cook until all the vegetables are tender, about 15 minutes. Stir in the chicken broth and simmer for 10 minutes, stirring occasionally. In a blender or food processor, puree the soup until very smooth, and then return it to the saucepan. Bring to a simmer and season to taste with salt (optional) and pepper. Serve hot, topped with a Tablespoon of yogurt and a sprinkling of parsley. The majority of Guatemalans (approximately 60 percent) are Roman Catholic. The traditional Mayan religion, however, still exists and is widely popular throughout the country. Both religions have holiday and festival celebrations, although there are several special days throughout the year that are observed by everyone. The country is also home to several minority groups. Christmas and Easter are two of the most widely celebrated holidays in Guatemala. The days before Christmas are filled with parties and various festivities, including decorating homes with manzanillas (small, yellow fruits) and watching fireworks. Tamales and punch are often served on Christmas Eve. Holy Week, also known as Semana Santa, is celebrated the week before Easter. Guatemalans dress in colorful costumes to celebrate the week of festivities, which includes floats, music, and all types of food. Fish, chickpeas, torrejas (pastries similar to French toast), encurtidos (spicy vegetables with vinegar), and candied fruits are popular foods during this time. Those of Mayan descent often feast on tobic (vegetable, beef, and cabbage soup), kilim (chicken in a seasoned sauce, served with rice and potatoes), joch (a hot drink made of ground corn, barley, cinnamon, and brown sugar), and cooked fresh fruit, such as peaches or pears. Small doughnuts glazed with honey and cinnamon, called bunuelos (boon-WAY-lows), are popular holiday treats. The first day of November marks All Saints Day, also known as the "Day of the Dead." Rather than a day of mourning, it is a time to celebrate the lives of loved ones that have passed away. To feel close to the dead, families often have a picnic on top of a loved one's grave. Children's parties frequently feature pinatas , hollow decorations filled with toys and treats. Blindfolded children attempt to break open the pinata with a stick to release the treats inside. Weddings in Guatemala often feature bell-shaped pinatas that are filled with raw beans, rice, and confetti. Combine the water and butter in a heavy saucepan and bring to a boil. Remove from heat, and use a wooden spoon to mix in the flour mixture. Mix in the eggs, 1 at a time. Heat the oil in a deep skillet over medium to high heat. Shape the batter into balls about the size of a golf ball. Carefully slip them into the oil. Be sure not to crowd the skillet (cook separate batches, if necessary). Using the wooden spoon, keep moving the bunuelos around so they will puff up and brown evenly. When golden brown, remove them to a plate lined with paper towels. Top with cinnamon sugar or powdered sugar, or serve with a side of honey. Place all ingredients into a large, stainless kettle and bring to a boil. Reduce heat and simmer 45 minutes to 1 hour. Guatemalans who live in urban areas generally eat three meals a day. 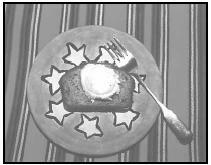 Breakfast most often consists of coffee, eggs, beans, or toast with marmalade. Lunch is traditionally the largest meal. Soup is often served, followed by meat, rice, vegetables, and a simple salad. Fresh fruit or pudding may follow the meal. Dinner, eaten around 7 or 8 P.M., usually includes such foods as sweet bread, beans, artichokes, rice, lamb, or grilled snapper. Fried plantains, flan (caramel custard), or fresh fruit are popular desserts. A rural diet normally contains more simple ingredients. The day may begin with coffee, black beans, and tortillas. A midmorning snack around 10 A .M. may be atole , a sweet corn drink. Following a traditionally large lunch, another snack, such as coffee and a sweet pastry, is usually enjoyed around 4 P.M. Eggs and vegetables often accompany black beans and tortillas (often made by combining ground cornmeal with lime juice) for dinner. Extremely poor Guatemalans sometimes eat little more than corn, beans, and fruit. When guests are invited for dinner in a Guatemalan home, it is polite to bring a small gift to the hosts, such as candy or flowers, but most people prefer that the guest simply bring dessert. Those dining at a restaurant will have several options for international cuisine: Spanish, Mexican, French, Italian, Chinese, Caribbean, and Mediterranean, to name a few. A 10 percent tip is suggested at most restaurants. As an alternative to traditional food, American fast food chains have established themselves throughout the country. They provide quickly prepared meals and are relatively inexpensive. As of 2001, several of the most popular American chain restaurants existed in Guatemala, in addition to other chains. Fill the cucumbers with the mix and refrigerate for 2 hours. Mix the ingredients in a bowl using a wooden spoon. When well mixed, place on aluminum foil and form into a ball. Pepinos Rellenos combine the cool firm flesh of the cucumber with a soft, creamy, flavorful filling. Soften the butter to room temperature and mix it with the sugar in a mixing bowl until light and fluffy. Mash the bananas and add it to the butter and sugar mixture. Add the salt, lemon juice, cinnamon, and egg. Sift the flour with the baking powder and slowly add it to the liquid mixture. Pour the batter into a greased loaf pan, approximately 9 x 5 inches. Bake in oven for 1 hour, or until a toothpick inserted into the center comes out clean. Serve with honey as a cake bread, or as a dessert with cream or ice cream. A slice of banana bread is a simple snack; when served topped with butter or honey, it is an accompaniment for a salad or light meal; when topped with whipped cream or ice cream, it becomes dessert. About 17 percent of the population of Guatemala is classified as undernourished by the World Bank. This means they do not receive adequate nutrition in their diet. Of children under the age of five, about 27 percent are underweight, and more than 50 percent are stunted (short for their age). It is estimated that the poorest half of the population gets only 60 percent of the minimum daily caloric requirement. Malnutrition, alcoholism, and inadequate housing and sanitation pose serious health problems. Fodor's Travel Publications, Inc. Fodor's Upclose Central America . New York: Fodor's Travel Publications, 1999. Footprint Handbooks Ltd. Mexico & Central America Handbook 2001 , 11th ed. England: Footprint Handbooks, 2001. Let's Go Publications. Let's Go: Central America . New York: St. Martin's Press, 2000. Lonely Planet. Lonely Planet Central America . 3rd ed. Victoria, Australia: Lonely Planet Publications, 1997. Epicurious.com. [Online] Available http://www.epicurious.com (accessed February 23, 2001). Guatemala. [Online] Available http://www.latinsynergy.org/guatemala.html (accessed February 23, 2001). Guatemala. [Online] Available http://cwr.utoronto.ca/cultural/english2/guatemala/guatemalaENG.htm (accessed February 23, 2001). Guatemala Cultural Tour. [Online] Available http://www.larutamayaonline.com/aventura.html (accessed February 27, 2001). Guatemalan Food. [Online] Available http://www.atitlan.com/ (accessed February 23, 2001). Latin American Recipes. 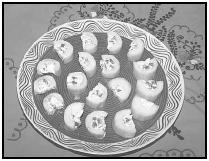 [Online] Available http://www.ma.iup.edu/Pueblo/latino_cultures/recipes.html (accessed February 23, 2001). Sally's Place for Food, Wine, and Travel. [Online] Available http://www.sallys-place.com/food/ethnic_cuisine/guatemala.htm (accessed February 23, 2001). Semana Santa. [Online] Available http://casaxelaju.com/tours/semana/food.htm (accessed February 27, 2001). Thank you for this site. I will be the proud auntie of an adopted 5yr old nephew from Guatemala in a few days. I am learning about his environment so as to make an easier transition for him when he arrives. I will be making various dishes with which he is (and some, is not) familiar. Thank You very much for this website. I am doing a Spanish II Project an needed information about the food of Guatemala and a little bit of history. Your website had everything that was need to get me a great grade on my Project. I tried some of the food's that were posted on you site and loved them. Thanks a bunch!! soo is there any history behind the guatemalan corn cake? Very informative! I really needed this for my Spanish 1 project and it's so great I found this page!! If you are doing a project or just want more information on Guatemala, I highly recommend everyculture . com /Ge-It/Guatemala.html (Sorry, but links are not allowed so just remove the spaces and add on the necessary parts) :) have a great day, y'all!! I was born and raised in guatemala and a lot of the foods mentioned, we don't really eat or make. However, we do eat a lot of corn based foods such as, atol de elite, tamales de elote, beef tamales, chuchitos. We also eat tostadas and put beans on a lot of dishes even if they are sweet such as rellenitos (mashed sweet plantains made into a ball with refried beans inside). Cucumber soup? never even heard about it. Hola me llamo Juan. Yo pienso que esto esta bein. Ok gracias por su tiempo.